I used to love ice cream. One of my favorite treats was to have a big bowl of vanilla ice cream covered in chocolate syrup and mixed until it looked like a creamy chocolate shake. Another was going to Baskin Robbins where I always had their famous Peanut Butter and Chocolate ice cream. Once in a while we’d go to Cold Stone where I’d get chocolate ice cream with brownie bits mixed in. (Apparently I’m a fan of chocolate…) However, since I have been introduced to the wonderful world of Gelato, regular old ice cream is a thing of the past. A few months ago, I had never tried Gelato. I had only heard about the mysterious Fine Italian Ice Cream in Italy and The Venetian in Las Vegas, but never had the opportunity to know for myself what it was all about. Fortunately, some good friends of ours opened a Gelato shop a few months ago not too far from my work called Bellissimo Gelato. Before visiting, I didn’t know what to expect. I thought maybe they would have four or five flavors; chocolate, vanilla, berry something or other, maybe a caramel marble swirl or something, but I never anticipated seeing a freezer case containing dozens of flavors! Luckily they have little plastic spoons so you can taste test and make an educated decision before ordering. On my first visit, I must have tried about 20 different kinds, some of which were: Wild Strawberry, Peach-Mango, Cinnamon, Green Apple, Chocolate, Mascarpone, Watermelon, Forest Berries, Cheesecake, Peanut Butter and Jelly, Caramel, Lemon, Lime, Papaya, Banana, Pineapple, Kiwi, and Coconut. And then I found out you could do a combination of two in your cup, so you didn’t have to just pick one flavor. It took me at least 15 minutes to decide what my first official order was going to be. Finally, I decided to get Wild Strawberry on one side and Pineapple on the other. It was SO fantastic; smooth, delicious and nothing like I had ever tasted. It’s something much better than ice cream ever was. And to know that all my life I had been missing out on this delightful treat! I ended up going back the next day to try some more; I did another combination and chose Forest Berries and Cheesecake. Again – fabulous. A few days later I tried Lemon and Chocolate. Delectable! I was hooked. I’ve been back more times than I care to admit and have tried all their flavors. (They keep making new ones too!) Recently they added Almond, Peach, Peanut Butter & Chocolate, and Mango. All delicious. In fact, now they have a few Sugar-Free flavors (Chocolate, Raspberry and Custard) and they are every bit as tasty as the others. (I’ve tried them, surprised?) You can get a small, medium or large in a cup, as well as pints and quarts in nifty containers that keep it cold for a surprisingly long time. They now offer “frequent indulger” cards that can be punched with every order. I’m already well on my way to free Gelato, what could be better?! Visit Bellissimo Gelato at 5500 South 900 East, Murray UT. You won’t be disappointed. All their machinery for making and storing the Gelato (made daily) is imported from Italy and they use only the freshest ingredients. 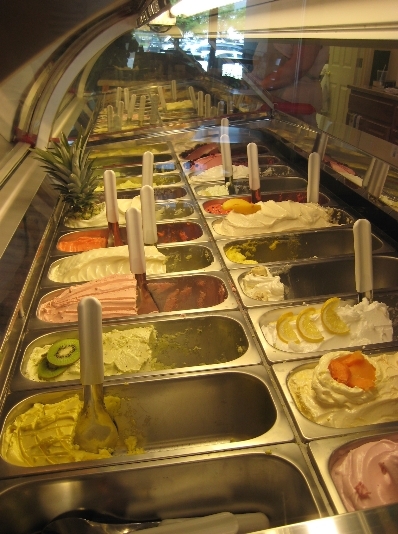 From now on, if there’s ice cream around I’ll be wishing it was Gelato from Bellissimo. I’m a changed woman. I crave Gelato. Ice cream is so 5 months ago! If you’d like to read another review on Bellissimo Gelato, click here. Congratulations on your fantastic first post, sweetheart! Incidentally, my personal favorite combination at Bellissimo is mascarpone and caramel. That is hands-down the best. Awesome post, I love ice cream, but I love genuine Italian gelato even more so! Looking at the picture, they look everything like I would expect them to look. Now, I shall go and find myself green apple ice made by real Italian Gelatistas. Tell Rich he needs to open one out here in Sandy, too! I really have to go there… they are practically right next door to me! Sounds so good. There is a new place out by us, not sure if it’s as good, but you should try it. Well….I think I’m just going to have to go over there and check things out myself, being the ice cream lover that I am, and now knowing there’s something even BETTER? It’s like having an Olive Garden nearby, and then a Macaroni Grill goes up just ‘around the corner’! And it just so happens that even though I’ve never seen this place… it’s just ‘around the corner’ from my parents’ old house, aka: my old stomping grounds. Must go have a look-see then. Hey, maybe I’ll see you there! Ha! It’s definitely worth the trip – let us know when you want to go and we will meet you there!